Located in Schenectady directly on the Mohawk River, The Glen Sanders Mansion is a beautiful and historic venue to host an amazing event. The structure was originally built in the late 1600s as a trading port. Originally owned by the Glen family, the mansion hosted many historical figures such as George Washington and Louis Phillippe of France. It became The Glen Sanders Mansion in 1739 when Debra Glen married John Sanders. It stayed in the family until 1961 when it became an Inn. Angelo Mazzone bought Glen Sanders in 1988, which started his restaurant and catering empire. Glen Sanders has been operated by Mazzone Hospitality ever since. Another benefit of having your event at The Glen Sanders Mansion is that it is also an Inn, making it the perfect option for getting ready on your big day or for accommodations for your out of town guests. The Glen Sanders Mansion is a great choice for a venue because of its beautiful architecture, rich history and beautiful waterfront view. Having an event at Glen Sanders Mansion would be truly unforgettable. The newly renovated ballroom is traditional and historic. Neutral décor and architecture allows our clients to create any look they desire. Total Events can transform the venue by adding dance floor, a variety of chair choices and specialty linens from The Collection. 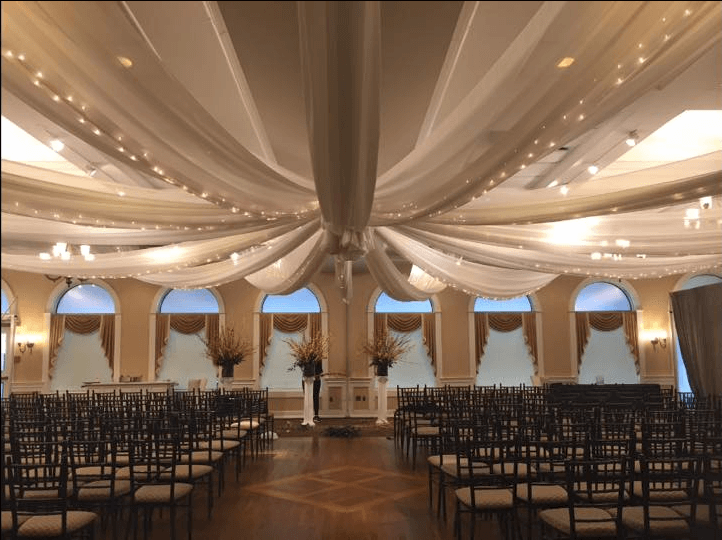 Our signature décor option includes our white ceiling swags and drapery across the back wall, with the option to feature illuminated drape! Planning your next event at the Glen Sanders Mansion? Contact us today to start your #TotalEventsTransformation!